Optidrive E3 - 0.5 to 15HP General Purpose, flexible, expandable variable frequency drive. Optidrive - 0.5 to 250 HP Industrial drives with filters, brake output transistor, reactors. High starting torque & output up to 1000Hz. Optidrive Plus - 0.5 to 250 HP High performance Sensorless Vector with filters, brake output transistor, reactors and drive.web option. 100% torque at zero speed. 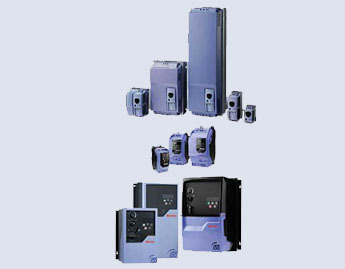 Optidrive E - 0.5 to 5 HP low cost variable frequency drives. Optidrive E1 - Up to 1.5 HP, for use with single phase 115 and 230 volts AC Shaded Pole and Permanent Split Capacitor motors. Optidrive Options - Optiport, encoder feedback and other options. Optidrives show their colors where others fear to tread! For tough jobs in harsh environments the Optidrive has the capacity to handle repetitive overloads, heavy braking, poor power quality and wide temperature ranges without flinching. In multi-drive systems the Optidrive offers all the options you will need for secure, high performance networking with fiber optics, Ethernet and most other communications standards. The Optidrive high frequency output capability (up to 1000Hz) provides excellent control for high speed spindle motors in machine tools, centrifuges, grinders, routers, etc.